It’s so big, in fact, Nintendo can’t wait to show it to us. In a tweet from Nintendo UK, the company teased “a new world, new mode, new playable character, and more” in the free update. 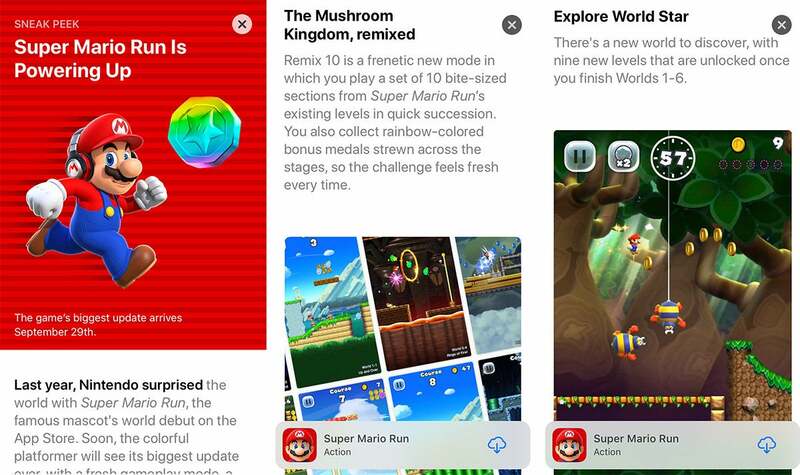 Additionally, the new iOS 11 App Store features a sneak peek of the new version, though, rest assured Android users, Nintendo isn’t limiting the update to iPhones this time. The main enhancement to the original Super Mario Run will be a new mode called Remix 10. Described as “frenetic” in the App Store description, you’ll be able to play a series of 10 “bite-sized sections” from current levels in quick succession while collecting randomly scattered bonus medals. Notably, Remix 10 won’t have a “game over” screen, so kids and newbies will be able to enjoy it without getting too frustrated. Once you rescue the princess in Remix 10, she will join the game as a playable character. Her special ability is double jump, which will help die-hard players get to coins that were hard to reach before. There’s also a new world in the new Super Mario Run. Those who have finished Worlds 1-6 will unlock World Star world, with nine new levels filled with “new enemies, cool gameplay mechanics, and… pink, purple and black coin-collecting challenges.” Nintendo also says there will be surprises for Super Mario Run players of all skill levels. And, finally, you’ll be able to choose your own music while playing the new game. When you pick different music, your character will wear headphones while playing—because we all know they need to hear the official soundtrack to get motivated. The full version of Super Mario Run will get a super price cut to $5 when the update lands on Friday. So if you’ve been itching to buy it, you might want to wait a few more days. Why this is so super: We all love updates to our favorite games, but this one’s just a little more special. For one, it’s Mario. But aside from that, it’s good to see Nintendo still paying attention to a game that’s nearly a year old. Nintendo took some flak when customers found out that Super Mario run was a freemium title (free to download with a $10 in-app purchase to unlock the full game), but the company has steadily added new features and levels to keep it fresh and exciting. We know Nintendo’s hands are full with its promise of two to three new mobile titles each year, so it’s nice to see it hasn’t forgotten about the games we’ve already paid for.